Whenever we have dinner out in either Patitiri or the Old Village of Alonnisos our usual custom is to stop by the Italian Gelateria for a bit of dessert before heading back home. The location in Patitiri is situated perhaps just 50 meters from the harbor on the right side of the main road going up towards the Old Village, it was originally started by two wonderful and very friendly women from Italy, Jana, and Julianna, who brought with them their craft of making incredibly delicious Italian ice cream. Prior to the summer tourist season in 2007 they sold the business, but made sure to teach the new owners they needed to know about making the ice cream with the same level of quality and taste that customers had become accustomed to over the years. I can speak from personal experience that the ice cream they sell is simply fantastic in every way. It truly is the perfect dessert food to end any evening spent in Alonnisos. The Gelateria location in the Old Village (pictured to your right) opened during 2008 and is really convenient for anyone staying up there. It’s located perhaps 60 meters from the bus stop in the Old Village as you walk up toward the main square (or in Greek, “plateia”) of the village. When you do visit Alonnisos and find your sweet tooth calling you after dinner (or at any other time), rest assured that you can’t go wrong stopping by either location of the Gelateria locations. Located in Patitiri, perhaps one kilometer up from the harbor on the left side of the street and directly across from the Pappou Market, is the Artosinisi Bakery. 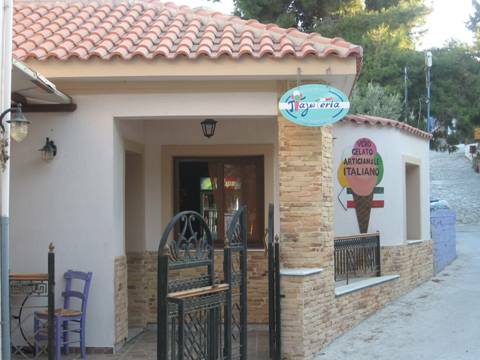 Each morning during the height of the tourist season this bakery always attracts a large number of customers, and is also frequented by the owners/managers of numerous restaurants and tavernas on the island. The Artosinisi Bakery offers a large selection of freshly baked foods, including both white and dark breads, a wide variety of cookies, milopita (mini apple pies), cheese pies, spinach pies, and much more. In addition, they sell affordably-priced breakfast and lunch food, including baked bacon/ham and cheese pies and traditional ham and cheese and vegetarian sandwiches on small submarine rolls. During our most recent trips we purchased sandwiches for lunch there on several occasions and really enjoyed them. If you want to economize on lunch or breakfast there’s really no better place in Patitiri than the Artosinisi Bakery. This bakery also sells a variety of juices, and uniquely offers soy milk and other non-dairy products, apple cider vinegar, coconut oil, and some novelty foods you most likely wouldn’t find anywhere else on the island. 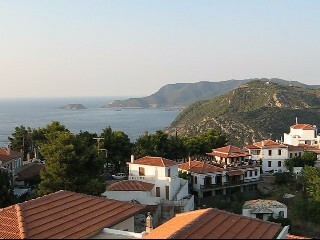 The upper portion of plateia area (town square) of the Old Village of Alonnisos provides a spectacular view to the east (see photo down to your right). To reach this part of the village, from the bus stop walk up to the point where the road ends at a small café (this is actually the main plateia). There is also a very historic church located opposite-right of that cafe. Then, turn left and follow the plaka/cobblestone path until you see another café/bar called the Naval (a great place run by our good friend Nikos, which features a novel menu that includes delicious crepes by the way), then veer left again and climb a bit further until you reach a plateau with steps to your right (see photo to your left). From that area you will be able to take some great photos. To see a brief YouTube video of the view from this area, click here. 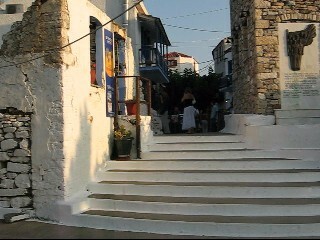 When you climb those steps you will then be part of what I call the “Old Village promenade,” the main path that cuts through the village, weaving it’s way past restaurants (estiatorios) including “The Kastro” operated by my friend Nectarios, as well as various shops, including the Gallery 5 art gallery and candle store (pictured to your right) operated by the renowned Danish artist Bente Keller. 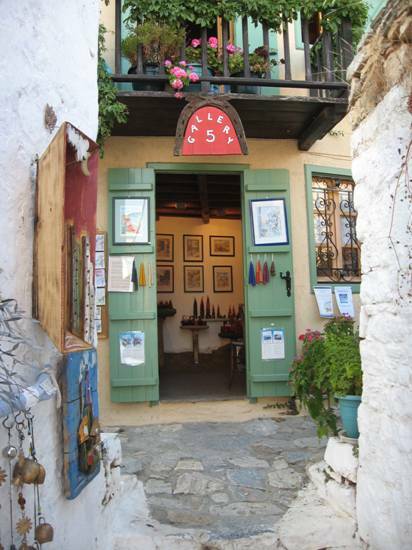 At the very end of the promenade is a very popular sweet shop and restaurant called “Xagiati,” which has become one of the most popular locations in the Old Village because of its home-made sweets, fresh brewed coffees/cappuccinos, and aperitifs. While initially Xagiati offered only sweets, today it also includes other food choices, dishes that are lighter faire than those offered at estiatorios and tavernas. 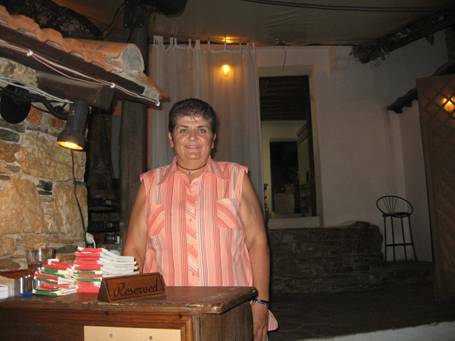 The proprietor is a very friendly and hard-working woman named Meni (pictured to your right), and based on the fact that Xagiati is always packed with customers, you know for certain the food is excellent. 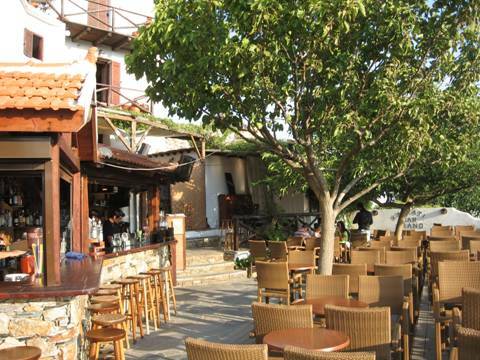 In addition, in recent years Xagiati has been offering excellent evening entertainment in the form of musicians performing both Traditional and Modern Greek music. When you visit Xagiati, and it’s simply a must if you’re in the Old Village in the evening, ask for Meni and tell her that Jeff & Andrea from the USA sent you!